This past weekend, witness an end of an era and the beginning of another era. Pacquiao defeated Tim Bradley easily and left no doubt who was the better fighter in their trilogy. The fight was fought at a measured pace with Pacquiao averaging only 35 punches per round and Bradley 25 punches per round but the two Pacquiao knockdown of Bradley in the seventh and ninth round highlighted the difference between the two fighters. 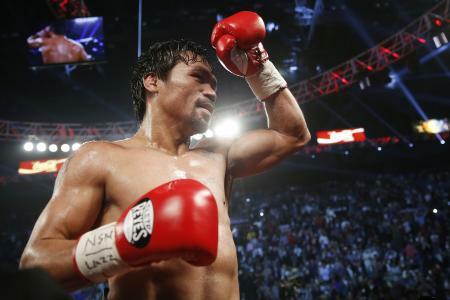 Despite having a shoulder surgery and being 37 years old, Pacquiao dominated most of the action after the third round. He landed the more meaningful punches, controlled the pace of the fight and his power showed up in the seventh and ninth round. Bradley is a very good fighter who has his share of quality wins including over Pacquiao nemesis, Juan Marquez but against Pacquiao, he was not quite quick enough nor did he have the power to deal with Pacquiao. Bradley was facing one of this generation greatest pound for pound fighter. This trilogy was simply a case of very good fighter losing to a very great fighter with Pacquiao skill level just enough to win. On paper, this was the rubber match but in reality, Bradley first victory over Pacquiao was controversial and the other two were easily seen as Pacquiao’s victory. For Pacquiao, this should be the end as he has nothing more to prove and at 37, not much left after a career of fighting some of the best of his generation. This is the best way to say good bye to the sport he loved and represented and now he can move on to his second career of being a politician. On the heavyweight side, Anthony Joshua showed that he might be real deal as he demolished Charles Martin in two rounds. The fight was even as close as the two round massacre showed as Joshua showed from the very first punch he connected that he was the more powerful fighter. Martin tasted Joshua power in the first round and retreated. With his Olympic pedigree, Joshua showed not just power but technical skills that American heavyweight Deontay Wilder is still learning on the job. Joshua looked polished and showed that he might just be ready for the other top heavyweights including Fury, Wilder, Povetkin, Ortiz and Klitschko. The heavyweight is back to multiple champions, all with legitimate claims of being the guy now that Wladimir Klitschko showed evidence that his reign as heavyweight in nearly over even if he manages to win his rematch with Fury. Wilder must get by Povetkin in what will be his toughest match to date and will anyone dare to fight Luis Ortiz for a championship? I suspect that Joshua may opt to fight a British fighter just as David Hayes, Dereck Chisora or wait for the winner of Klitschko-Fury but I would love to see a Joshua-Ortiz fight with two powerful punchers with solid amateur background. These two may actually be the best heavyweights in the world. On the Paquiao undercard, Gilberto Ramirez won an easy victory over Arthur Abraham and became the first Mexican Super Middleweight. He won easily on all cards in a white wash and he simply out boxed and out maneuvered the veteran Abraham as he hurt Abraham early in the fight while spending the rest of the fight controlling the real estate between the two. He avoided Abraham sledgehammer punches and used the full ring to effect. While this fight promised fireworks, Ramirez avoided fireworks and concentrated on winning the fight which bored fans but the goal is to win. Featherweight Oscar Valdez annihilated Evgeny Gradovich with a fourth round knockout and showing the boxing world that he is no longer a prospect but a serious contender for a title. Pacquiao says good bye and ends an era while Joshua may begin a new era in the heavyweight division while Ramirez and Valdez begin their own march to boxing superstardom.